You can see the appearances, feel the natures and essences, and experience the powers, influences, causes, effects, and recompenses of these two Gohonzons with your life. I didn't know you could read Chinese? 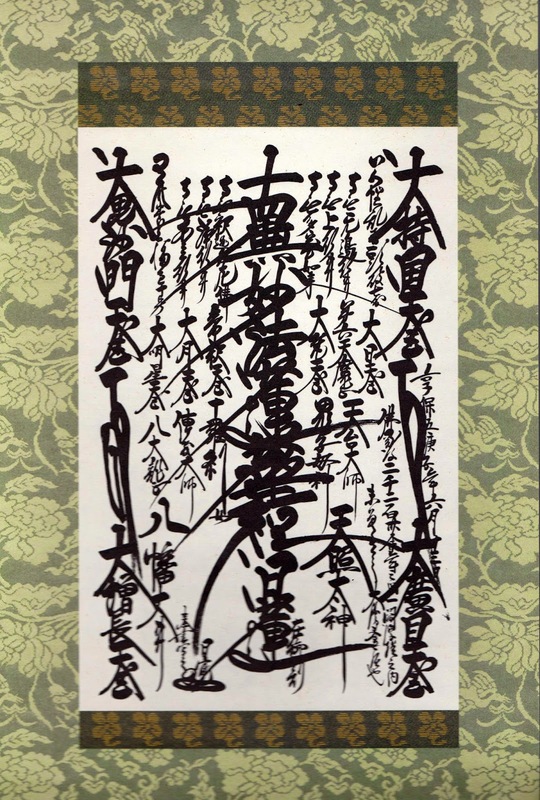 How about this Nichiren Gohonzon, do you think the SGI Gohonzon has a superior format to it: http://markrogow.blogspot.com/2014/03/mounted-gohonzon-for-transmission-of.html ? Perfectly "formatting" the Gohonzon [if I understand what you mean by "formatting"] depends solely on the skill of the formatter and the quality of the scroll. One could even gold leaf the border were one so inclined. I think that would be the ultimate formatting for a Gohonzon. Now, if you mean the layout of the characters themselves, the Nichiren Gohonzon, which I compared to the SGI Gohonzon, is a ten world Expanded Style Gohonzon. The SGI Gohonzon is missing some representatives of the Ten Worlds, for example, Devedatta. Briefly, the Japanese god of smallpox -- Hōsō Kami 疱瘡神 -- is intimately associated with the color red in Japan. The first record of smallpox in Japan appears in the Nikon Shoki (日本書紀, approx. 720 AD). But the disease reached Japan much earlier, around the time of Buddhism’s introduction (circa 550 AD). The disease was very dangerous. If the ill person’s skin turned purple, it was considered serious. But if the skin turned red, it was believed the patient would recover. DEMONS AND DISEASE. In Japan, the color red is associated closely with a few deities in Shinto and Buddhist traditions, and statues of these deities are often decked in red clothing or painted red. There are many clues that underpin the red association. The most compelling clues involve demon quelling and disease (e.g., smallpox, scarlet fever, tuberculosis, measles). According to Japanese folk belief, RED is the color for "expelling demons and illness.” The rituals of spirit quelling were regularly undertaken by the Yamato court during the Asuka Period (522 - 645 AD). Centered on the fire god (a red deity), these purification rites were designed to purify the land by sending evil spirits to the Ne no Kuni (details here). This association with evil segues easily into other links with child mortality, protection against evil forces (sickness), fertility, the caul (embryonic membrane covering the head at birth), and other child-birth imagery. The red bibs, red robes, red scarfs, and red caps found frequently on certain Japanese deities (discussed below) lend strong support to this interpretation. This early association between demons of disease and the color red was gradually turned upside-down -- proper worship of the disease deity would bring life, but improper worship or neglect would result in death. In later centuries, the Japanese recommended that children with smallpox be clothed in red garments and that those caring for the sick also wear red (smallpox details here). The Red-Equals-Sickness symbolism quickly gave way to a new dualism between evil and good, between death and life, between hell and heaven, with red embodying both life-creating and life-sustaining powers. As a result, the color red was dedicated not only to deities of sickness and demon quelling, but also to deities of healing, fertility, and childbirth. Many countries outside Japan also have “red” traditions that are closely associated with sickness. See this outside site for details. 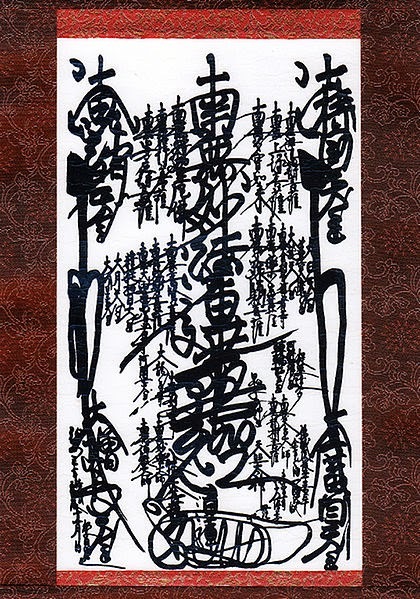 ten world Expanded Style Gohonzon. The SGI Gohonzon is missing some representatives of the Ten Worlds, for example, Devedatta." i am sgi member and searchin for other nichiren buddhism members. i know sgi gohonzon is computer gohonzon but how can i get an original gohonzon? practice with the same faith as Nichiren and study, study, study. I so and read very often in the gosho.but where do you get your gohonzon? From others, online, Gohonzon stores. Tell me about your faith and practice Madame. Since you practice not-Nichiren SGI pseudo-Buddhism, I think it would be incongruent for you to possess a copy of a Nichiren Gohonzon. Certainly, were you to acquire a copy of a Nichiren inscribed Gohonzon, you would no longer be welcome in the SGI [for the better]. Dim versus bright. Weak versus powerful. How fortunate we are to chant to a Nichiren Gohonzon!